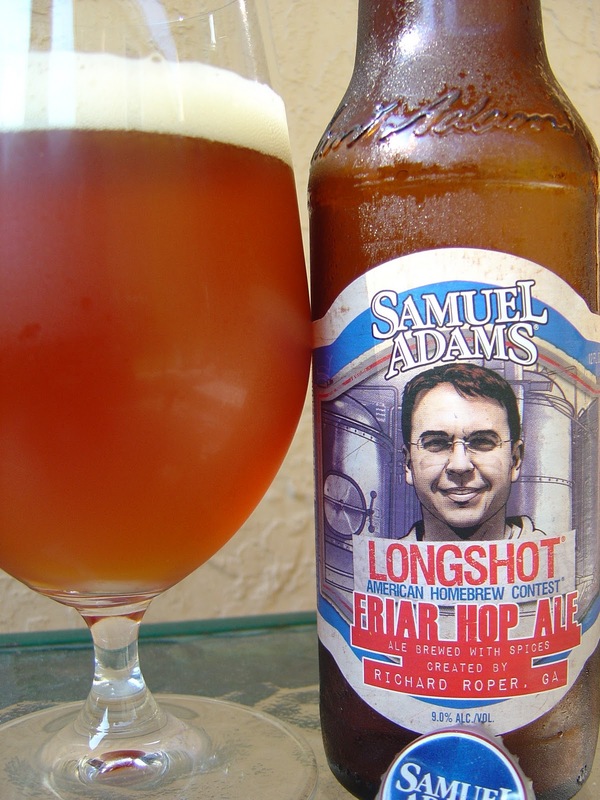 Today I'm drinking Longshot Friar Hop Ale brewed by The Boston Beer Company in Boston, Cincinnati or Breinigsville, Pennsylvania. Or as this label says, un-proofread, Brein-gsville, missing the "i". Tsk. Tsk. So this is their American Homebrew Contest in Category 23, the famous catch-all specialty beer category. This ale with spices was created by Richard Roper from Georgia, and there is a picture of him on the label in front of some large brewing tanks. Enjoy before September, 2011. Fruity, herbal, citrus aroma. VERY different flavors. Sugary and boozy to start. Caramel, spicy cloves and candy galore. Very prominent Belgian yeast as well. But so far, nothing is working together and zero is going right for this beer. It has a thick and syrupy consistency, is sickeningly sweet, terribly overspiced, and annoying 9.0% alcohol. There is not one ounce of hops, no balance. The only thing this has is ick. I don't like this at all. In fact, I just dumped the last third down the drain. It's nauseating to even think about it again long enough to write it down for this review. I drank the other of the pair of this beer that came in the Longshot sixer the other day. I didn't like it then either, but I thought that was because of the other beers I had before it. Nope! Those other beers actually protected it from displaying its full terrible self! So what I'm saying is... I hated this beer! And that is no April Fool's Joke! Well you gotta call'em like you see'em... or maybe taste'em. It seems like this brewer tried to do too much in one brew. Sometimes simple is good enough, or even better. It's fun to drink extreme beers and cask aged, oak barrel, bourbon barrel aged, blah, blah, blah... But sometimes a simple pale ale or kolsch is downright delicious. Have you tried the Samuel Adams Rustic Saision? Had one last on tap at Mellow Mushroom. Saison's are not my normal style, but I enjoyed it. What I can't believe is that Sam Adams brewed this beer. There was way too much going on with too many unpleasant flavors, and pros like Sam Adams should know that this beer will not appeal to most. Never even heard of Rustic Saison, though I am a fan of the style. Thanks. Please, God, let the other Longshots in that sixer be better!